Discover the rocky coastlines, sandy beaches, sweeping marshlands, and lush forests that drew artists such as Winslow Homer and Edward Hopper to the North of Boston region. Share their experiences and enjoy their work on display at museums, historic sites, and galleries throughout the area. Plus, experience the natural landscapes that have inspired artists for generations. The Art Escapes Trail celebrates the connections between art and place, and artist and community in Essex County. Along the trail, you will find some of the finest art collections and pieces in the country at museums, historic properties, and galleries throughout the area. Plus, you can experience the natural landscapes that have inspired artists for generations. 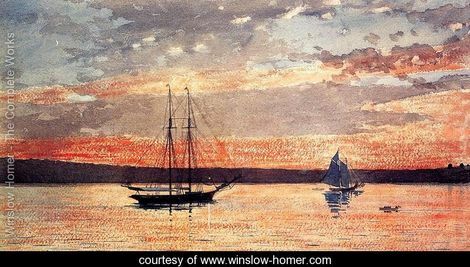 – the same views that inspired Winslow Homer, Childe Hassam, Edward Hopper, and so many others continue to attract artists of every persuasion, and inspire even non-artists to pick up brush or camera. Historically, Essex County’s artistic center is the peninsula of Cape Ann, comprising the towns of Gloucester, Rockport, Manchester-by-the-Sea, and Essex. Massachusetts’ “other cape” has hosted a thriving art community since the 1890s when the Rocky Neck art colony began on Gloucester. During the 1880s, hotels and inns were built that catered to both wealthy Bostonians as well as visiting artists who were beginning to discover the area in droves. Frank Duveneck was one artist who summered at hotels such as the Rockaway, Harbor View, Beachcroft, and Hawthorne, often with his students in tow. These so-called “Duveneck boys” included Theodore Wendel, John Twachtman, and Herman Wessel. 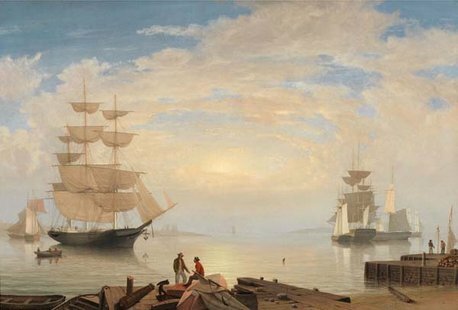 Fitz Henry Lane, Gloucester Harbor at Sunrise, c. 1850. Gloucester’s most famous native son is Fitz Henry Lane, who grew up in Gloucester, trained in Boston, but returned to the North Shore in 1847 where he soon built a gabled granite home overlooking the harbor. Extremely successful during his lifetime, his fame dwindled until the early 20th century when art historians reclassified his work, along with other painters influenced by New York’s Hudson School, as part of a loosely connected group now known as the Luminists whose paintings capture the ethereal beauty of the North Shore’s atmospheric water and light. Lane’s home still stands on Harbor Loop overlooking the harbor that fueled his creativity for so much of his life. Winslow Homer lived in the lighthouse on Ten Pound Island during his time in Gloucester between 1873 and 1880, where he began experimenting with watercolors, a medium of which he is now considered an American master. 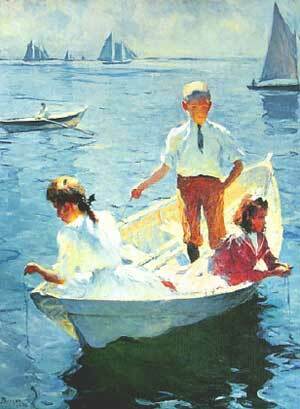 His iconic images of children on vacation and fishermen at work are often set on Gloucester’s shores. 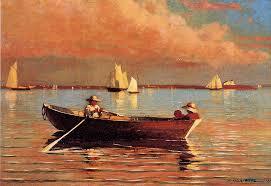 I went to Gloucester, Mass., on the enthusiastic recommendation of John Sloan. That was the place I had been looking for. It had the brilliant light of Provincetown [on Cape Cod], but with the important additions of topographical severity and the architectural beauties of the Gloucester schooner. Sloan, and Marsden Hartley later in the 1930s, both found inspiration in the wilderness area of Gloucester’s first settlement, Dogtown Common, that even then had been uninhabited for 100 years. Painter Cecilia Beaux, among others, founded the North Shore Arts Association in East Gloucester in 1922, and became so taken with the area that she eventually built a summer mansion next to designer Henry Davis Sleeper’s Beauport, where the neighbors entertained such art-world titans as collector and museum benefactor Isabella Stuart Gardner and famed portraitist John Singer Sargent. The list of former NSAA members is a veritable Who’s Who of American artists of the time: Frederick J. Mulhaupt, Frank Duvenek, John Sloan, Stuart Davis, Maxfield Parish, and Theresa Bernstein were all among the artists who exhibited here in the NSAA’s early years. Today, NSAA has a thriving membership of over 600 Artists Members and Associate Members, working in a variety of media and styles. In the interest of community involvement, nationally recognized exhibitions, NSAA also offers demonstrations, workshops, lectures, critiques, film presentations, and concerts. Bearskin Neck in nearby Rockport was home to its own art colony decades ago, which began to rise just as the existing granite industry began to decline. Although galleries and studios remain among today’s boutiques and souvenir shops, the most lasting testament to Rockport’s artistic heritage is the bright red fishing shack at Bradley Wharf that is known as “Motif #1” because of its status as possibly the most frequently painted building in the country. During the famous blizzard of 1978, the shack was destroyed, but it had become such a town icon that it was rebuilt immediately. 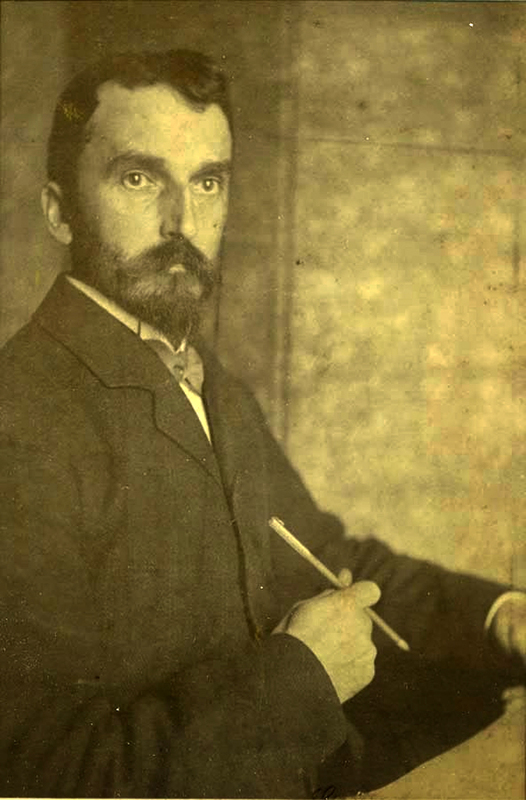 Ipswich native Arthur Wesley Dow spent many years studying in France, and moved back to Ipswich to launch his art career. A dedicated teacher, in 1891 he opened a summer art school in a house once owned by Ralph Waldo Emerson on the banks of the Ipswich River and began offering courses in painting, photography, pottery, basket-weaving, and other arts and crafts. He later taught at both Pratt Institute in New York and the School of the Museum of Fine Arts in Boston. Known as an exemplary painter, photographer, and woodcut artist in his own right, his most lasting legacy is his influence on art education and the work of the students, including Georgia O’Keeffe, who credit Dow as a major force in their development. American Impressionist Childe Hassam summered in Marblehead for twenty-five years over the turn of the century, and his 1918 Gloucester lithograph series is among his most art-historically significant work. Maurice Prendergast (1858-1924) also spent summers here and Marblehead is a frequent subject of his work. One of Marblehead’s least widely known, but most locally rooted artists is the self-taught J. O. J. Frost, who assumed the role of the town’s visual historian and produced hundreds of paintings of events in Marblehead history, from the gale that wiped out most of the Marblehead fishing fleet in 1846 to scenes of pigs being driven to market. Farther south in Lynn, artistic traditions were fostered by, ironically, an act of government. The Mandatory Drawing Act of 1870 made art education available to everyone in the state, and the Lynn Evening Drawing School was founded as a result. Although they are a footnote in the larger history of American art, the painters now known as the Lynn Beach Painters, including William Partridge Burpee and Charles H. Woodbury who worked from 1880 to 1920, formed a well-known local art scene and did much to encourage the visual arts in their hometown. Collectors have done as much to foster the arts in Essex County as the artists themselves. From the earliest days of maritime trade, ship owners brought exquisite works of art home from around the globe to towns like Salem, where the country’s oldest continually operating art museum, the Peabody Essex Museum, was founded in 1799 to house and display their souvenirs. After undergoing a major transformation in 2003, the museum has renewed and broadened its commitment to sharing the best in artistic creation from all corners of the globe, including notable collections of contemporary Korean, Indian, and Native American art as well as a remarkable collection of maritime art and work by outstanding New England artists. One of Salem’s most well-known native artists is Frank Weston Benson, born in 1862 to one of the city’s oldest families. He studied abroad and returned to Chestnut Street where he kept a studio for many years. (Swampscott-born painter Phillip Little was a studio-mate and later a neighbor.) His portraiture was much in demand, and gave him a successful enough income that he was soon able to turn away from commissioned work and concentrate on paintings of nature and animals. A prominent American Impressionist, he was also a master painter of birds and even served as honorary curator of ornithology at the Peabody Museum, precursor to today’s Peabody Essex Museum. The North of Boston region’s inland towns have supported the arts in a major way as well. The gifts of collectors and artists with ties to Andover’s Phillips Academy have made the school’s Addison Gallery of American Art one of the country’s premier small museums with a rotating schedule of innovative and top-quality exhibitions. The collection includes work by major artists who painted in Essex County such as Winslow Homer and Edward Hopper, as well as work by Andover alumni Frank Stella, Joseph Cornell, Walker Evans, and Carl Andre. Founded on industries from leather tanning to textiles, Merrimack Valley towns including Lawrence and Haverhill are rising again as old mills are transformed into artists’ lofts and live/work studios, and new galleries and cafes line downtown streets. The next generation of world-renowned Essex County artists may likely be preparing canvases in former stocking mills and firehouses right now. And with such a rich local artistic heritage and scenery that remains breathtaking no matter how often its viewed, photographed, or painted, the North of Boston region is sure to remain a hotbed of creativity well into the next century and beyond.